Citation for Public Architecture: 265 Lytton Avenue, Palo Alto — this beautiful Spanish-style mixed-use building considerately integrates historic architectural elements and downtown Palo Alto’s character. Citation for Interior Architecture: Venture Capital Firm, New York City — a 30-day designed and delivered project capitalized on natural light and 180 degree views of Midtown Manhattan, resulting in a clean, open environment that reflects the vitality of the VC industry. 2012 Emerging Professional Award: Christina Agudelo — she was recognized as a rising star in the architectural industry for her work coordinating the LEED certification process for over 3.5 million square feet of projects and integrating a sustainable design approach across DES’ projects. The awards jury praised the two honored projects wholeheartedly. 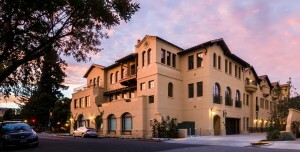 In regards to the Spanish Style mixed-use center in downtown Palo Alto, the jury boasted it’s “a perfect fit in Palo Alto”. The AIA SMC’s public architecture awards recognize significant projects developed with a confident sense of place, ecology, history and purpose. The 37,765-sf building includes an adjoining courtyard, which was completely redeveloped with aesthetic elements including the preservation of a centrally located signature oak tree. The venture capital project was truly an efficient blend of design space and time management for the 30 day design/completion timeframe of this 3,400-sf tenant renovation in the 80 year old PortAuthorityBuilding. The interior architecture awards recognize excellence in design and construction of residential, commercial and institutional interiors with a specific emphasis on relative place and purpose. The renovation was “very effective…the way it was designed really made it seem like a much larger space,” the awards jury noted. Founded in 1983, the chapter’s primary purpose is to represent local architects in public affairs and to be an architectural resource to the community. By focusing on community involvement and member support, we work to make sure that your concerns and interests are reflected in public policy matters affecting communities in San MateoCounty.